So, I’ve never had much of a sweet tooth. I know it may sound crazy to some of you (like my sisters), but yeah. Most of the time if I’m given an option between something sweet and something salty, I take the salty. Usually in the form of french fries. Apparently, I get this from my Mom. But tonight I wanted something…sweet-ish. Nothing too crazy, particularly because if I DO eat something sweet, I don’t like it to be too late or it messes with my sleep, but I did want a little something-something. And as I stood there in my kitchen waiting for inspiration to strike, to what did my wondering eyes appear but…a lovely brown plantain! 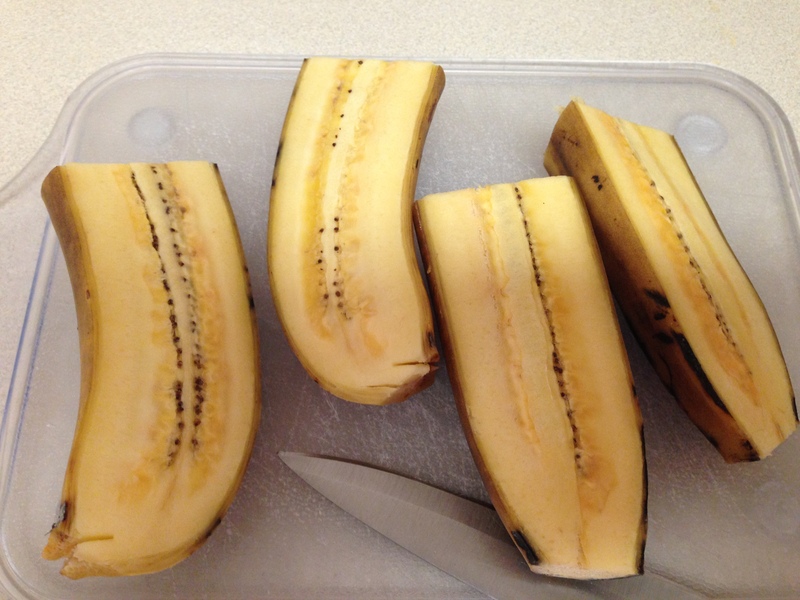 Ok, so the plantain didn’t actually appear…it was one of my spontaneous purchases during last week’s shopping trip. But I needed to use it up, so everyone wins! Anyway, it looks like a banana, right? It’s like, banana’s surly cousin. I mention surly because it’s essentially unsuitable to eat raw. According to the internet, it’s a starchy, lower in sugar member of the banana family that can be used in sweet OR savory dishes…which essentially means it’s perfect for me. 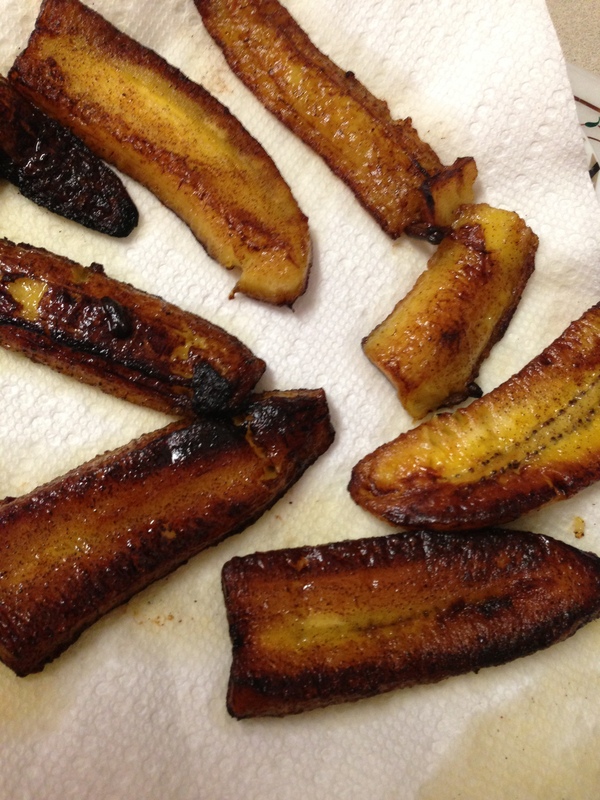 I haven’t had too much experience with the savory side of plantain cooking, but one thing I can do pretty well (basically because it’s super simple) is make caramelized fried plantains. Yum. 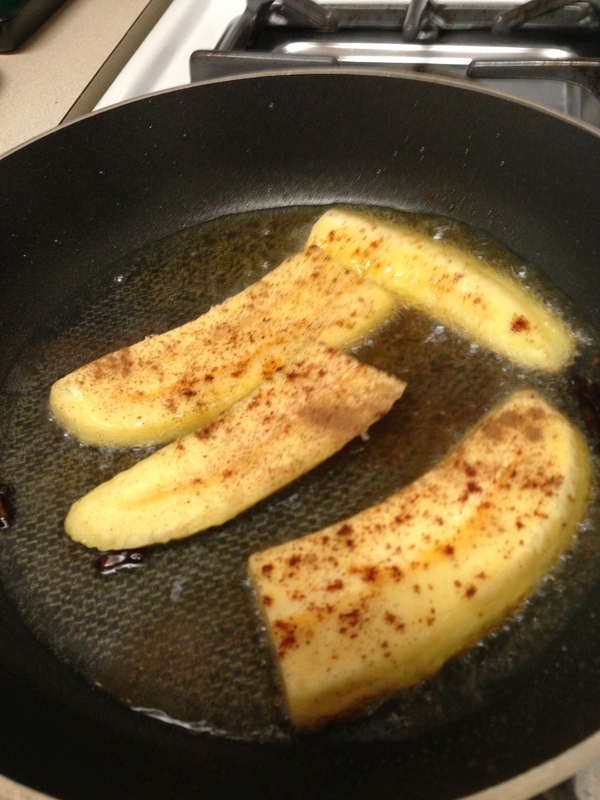 Basically all you need to do is slice your plantain (I cut mine in half and then slice it longways, you can also slice it in little rounds like coins), toss is in a skillet with some hot ghee or coconut oil (I find the coconut oil lends a little taste of the tropics to the already-somewhat-exotic-plantain), sprinkle with cinnamon, cloves, and chile powder, and voila! I like to add a little bit of chili powder for just a hint of a kick – it’s one of those things where you take a bite and there’s some sort of je ne sais quoi that you can’t put your finger on, but you know you love. It’s beautiful. Plus, chili powder + cinnamon? C’mon, people! 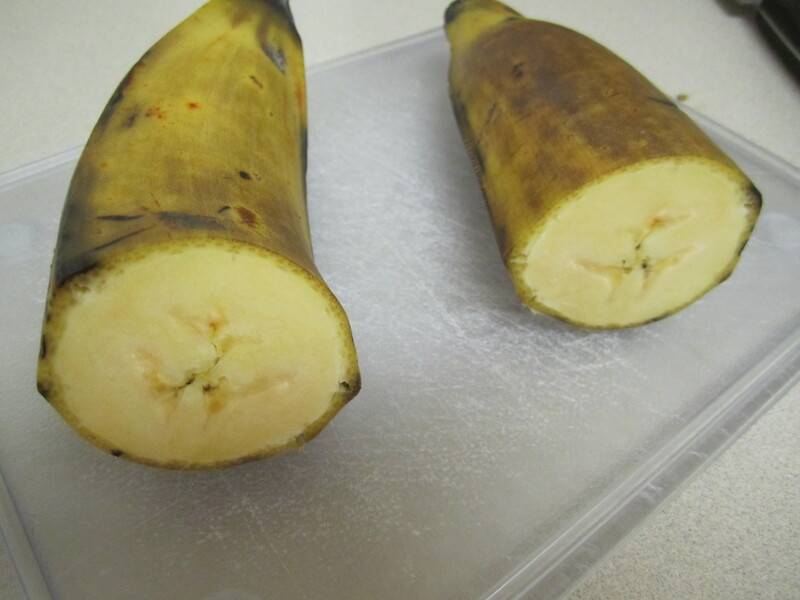 The plantains get a nice, crystallized outer edge but inside they are soft and creamy. It’s perfect for an after dinner dessert that’s not too heavy or sugary…if you’re in to that kind of thing. I bet if you ate this while wearing a bikini and floppy hat, it would totally be like you’re in Belize. 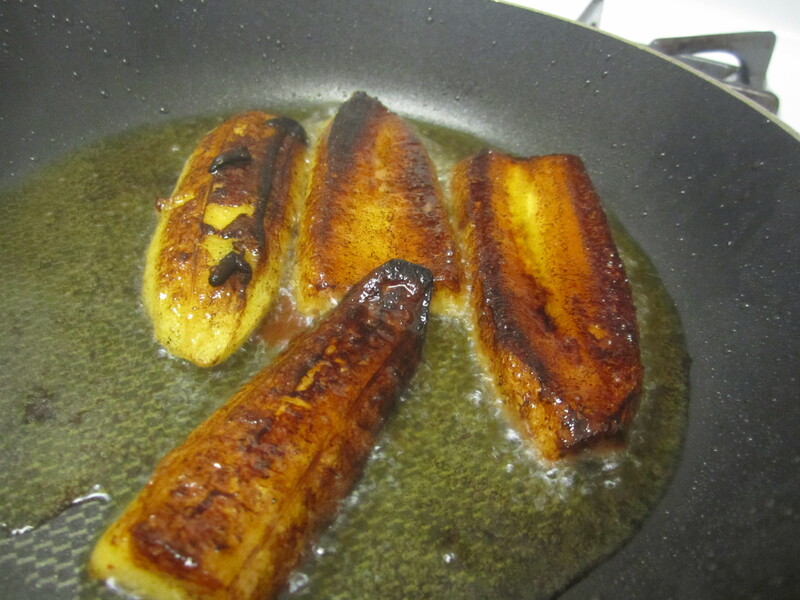 – Once the oil is hot, carefully add your plantain slices and sprinkle with ground cinnamon and chili powder to taste – I use less because I find the subtle-sweet flavor of the plantain and the coconut oil to be enough for me. 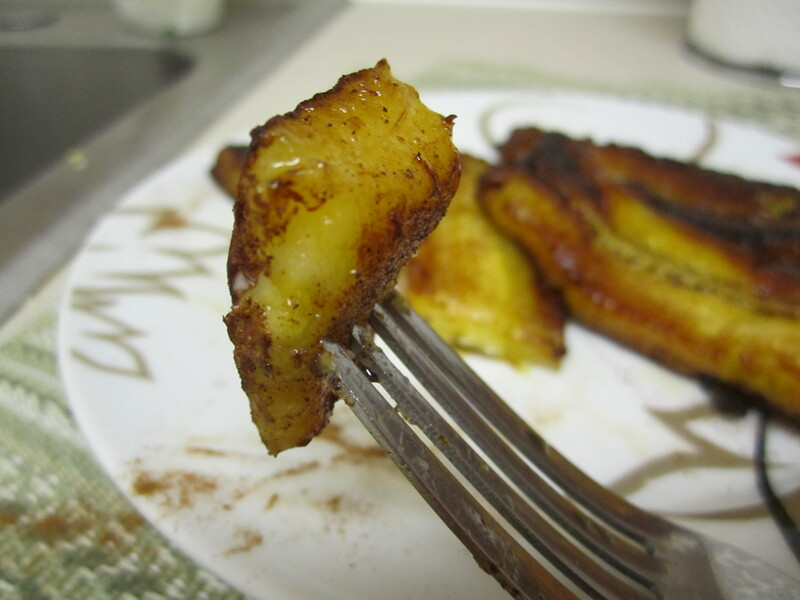 Fry til golden brown and caramelized on either side (about 1-2 minutes each side). You can do this in batches depending on how many slices you have. 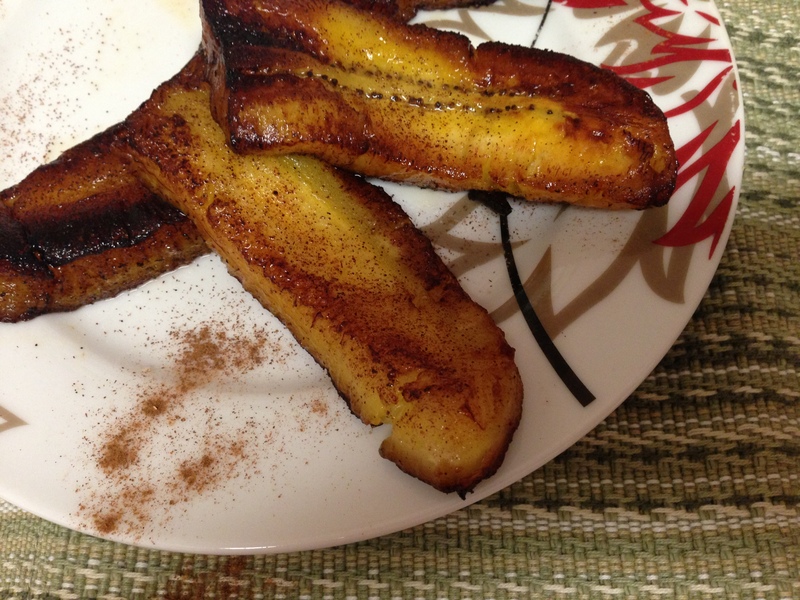 – Sprinkle plantain slices with a hint more cinnamon just before serving. Enjoy! PS. I totally took those photos with my new iPhone. Sweet! 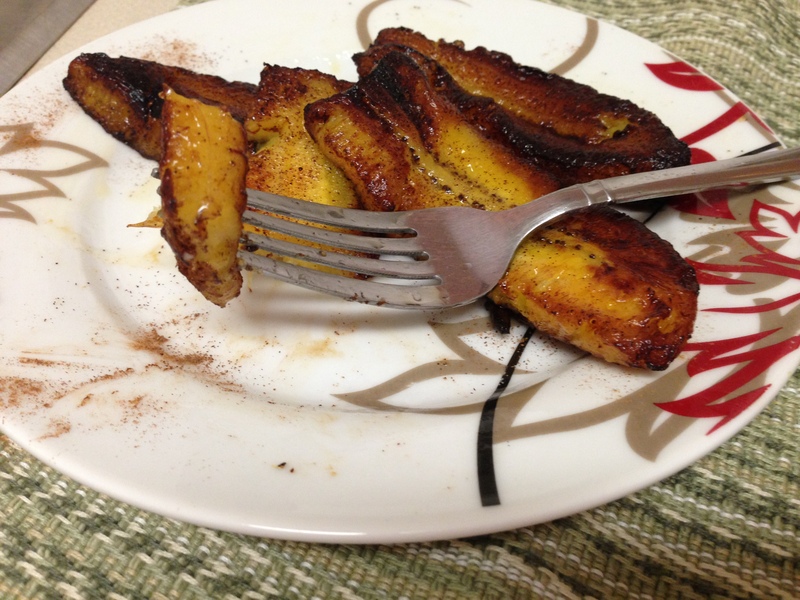 Posted on 1 May 2013 17 May 2013 by BeePosted in SweetsTagged dessert, plantain. Yuuuummmy! So delicious! But this post makes my heart sad…. it makes me miss Belize. 😦 And whenever I see starfruit in the store, I miss Belize too… I think of that starfruit farm I visited where you could pick the most perfect, ripe starfruit off the tree and it was the most amazing thing ever. Starfruit in the states is such a letdown.